Jim Beam White Label Kentucky Straight Bourbon Whisky is a popular Whisky available from Tesco Groceries in 70cl to buy online. Visit Tesco Groceries for the best price for 70cl of Jim Beam White Label Kentucky Straight Bourbon Whisky or compare prices on our other Whisky products. Following the end of prohibition Colonel James B. Beam established his distillery to become the famous brand that Jim Beam is today. 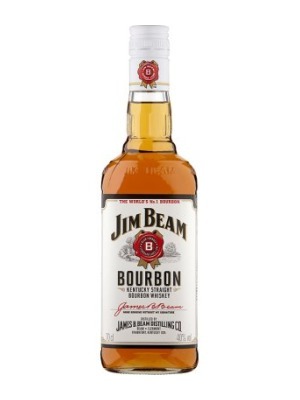 Jim Beam Original or White label as it is more commonly known exudes an air of vanilla and subtle flora. In the mouth high sweet notes move slowly to the gentle oaky tones of aftertaste confirming its place among the best of American bourbons. Where to buy Jim Beam White Label Kentucky Straight Bourbon Whisky ? Jim Beam White Label Kentucky Straight Bourbon Whisky Supermarkets & Stockists. You can buy Jim Beam White Label Kentucky Straight Bourbon Whisky online in most retailers and find it in the Whisky aisle in supermarkets but we found the best deals online for Jim Beam White Label Kentucky Straight Bourbon Whisky in Tesco Groceries, DrinkSupermarket.com, 31dover.com, TheDrinkShop, Waitrose Cellar, and others. Compare the current price of Jim Beam White Label Kentucky Straight Bourbon Whisky in 70cl size in the table of offers below. Simply click on the button to order Jim Beam White Label Kentucky Straight Bourbon Whisky online now.